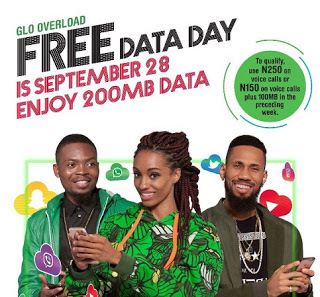 If you can recall around August 11th , when Glo first announced this free data day , and was later cancelled due to NCC telling them to stop , it was very saddening to everyone who has been anticipating , but as you all know Glo will never stop pleasing its costumers as they have declared September 28th Free Data Day again . For subscribers who used 100MB plus N250 on voice call or alternatively use N250 on calls whether purchasing data , browsing via PAYU a week before that day will enjoy a whole day of FREE BROWSING , live streaming,chatting and downloads on September 28th 2017. Note: To qualify use up to 250 Naira a week before the deal day to enjoy the ogbonge day !!!!!!! This stuff would have truly made sense had it been that the data volume wasn't capped.